Crock Pot BBQ Chicken Sandwiches should be nicknamed Summer’s best crock pot recipe for a picnic. 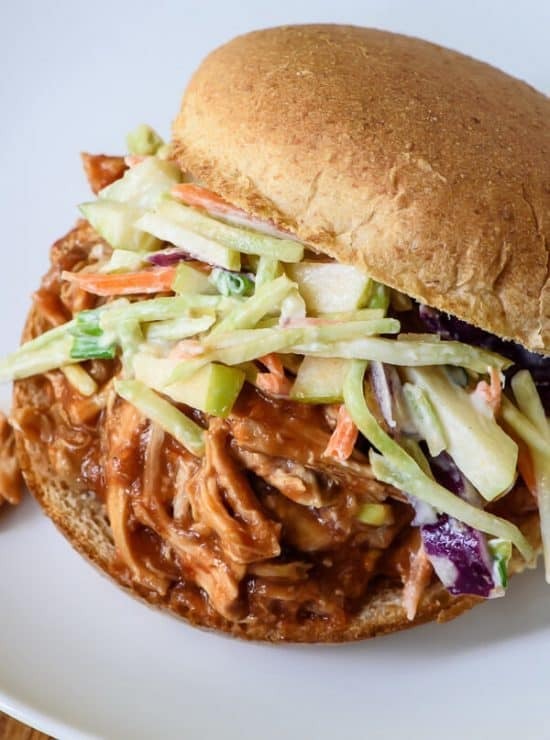 It might have the longest name ever—Maple Bourbon Crock Pot BBQ Chicken Sandwiches with Apple Slaw—but I didn’t want to leave you without a sense of the epic, messy, BBQ sandwich tastiness that awaits! Before we dive into these sammies (which you can certainly serve with this homemade barbecue sauce if you like) I wanted to share with you my new blog intro video, where I talk about what drives me and what you can expect to find here on Well Plated by Erin. It’s less than two minutes, shows shots of one of my favorite places on earth, and involves a rather compromising clip of me with wine when I didn’t realize the camera was rolling. All good things! OK, that we’ve seen what me + wine + dancing looks like and me, let’s get to this recipe. These sweet and savory Maple Bourbon Crock Pot BBQ Chicken Sandwiches are an ideal summer meal or game day entertaining recipe. Guests can help themselves while you relax, and everyone will be licking their fingers by the end. The slaw is cool and crunchy. I love it both on top of these sandwiches and as a stand-alone side. 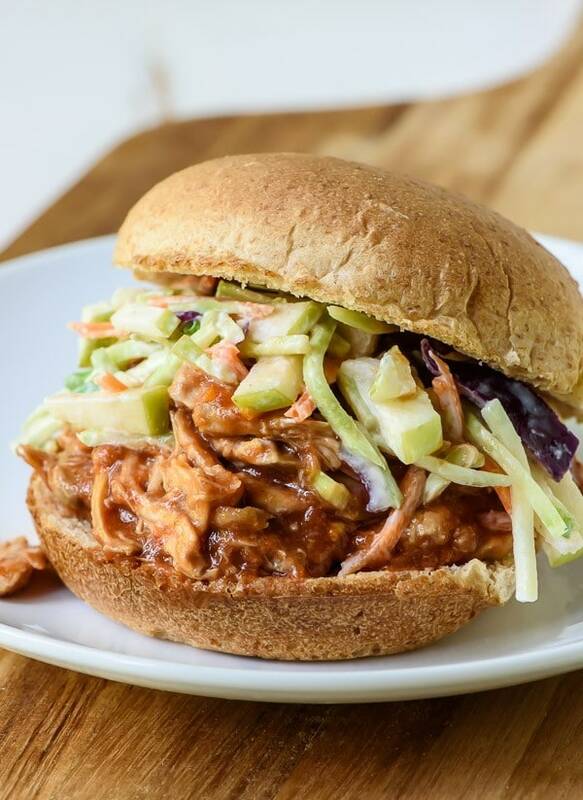 Moist and juicy crock pot BBQ chicken sandwiches topped with a crunchy, creamy apple slaw. You will be addicted to this sweet and savory combination! For the chicken: Place the chicken thighs in the bottom of a 5-6 quarter slow cooker. In a mixing bowl or large measuring cup, whisk together the ketchup, bourbon, maple syrup, apple cider vinegar, molasses, mustard, Worcestershire, onion powder, garlic powder, and red pepper flakes. Pour over the chicken. Cover and cook for 2 hours on high or 4-6 hours on low, until the chicken is cooked through. Transfer to a large bowl or plate and shred with two forks. Assemble the sandwiches: Spread the buns with Dijon mustard (optional). Pile the shredded chicken onto the bottom bun, top with slaw, then add the top bun. Enjoy warm. Leftover BBQ chicken can be refrigerated up to 4 days. Reheat gently on the stove. Leftover slaw can be refrigerated 2-3 days, but tastes best the first day (after 2 or so hours in the refrigerator to allow the flavors to meld) or the second day. That video is so stinkin’ cute! I loved it. ……almost as much as I love these sandwiches ;) Apple+BBQ is a winning combo for sure. Whooaaa…it’s only 9am but I’m already drooling over what I want for dinner! I don’t eat pork so I’m super excited to see a BBQ chicken recipe, and the fact that you paired it with apple slaw?! So much yes. Erin, LOVE the videos. . CONGRATS!!!!! Tangy pulled chicken sandwiches with some crisp apple slaw….sounds amazing! You’re adorable and I’m so proud of you and I want this BBQ chicken in mah face. This sounds really good. Definitely need to try the barbecue sauce, because I’m still looking for one to use for everything. I hope this one hits the spot Susan! You are AWESOME at video! Great job! First Video? You came across like a pro! Great job. Look forward to more. You are so kind. Thank you Marcia! Loved your video and love your recipes!!!! Looking forward to making this!! Thank you SO much Karen! That means a lot! What a fun surprise! You are so adorable and creative to boot! Absolutely love the videos…please do more! You are too kind! Thank you so much Lisa! Magnificent video Erin!! I’m absolutely drooling over this BBQ Sandwich!! Got to have this soon. Thank you so much Louis! I really really appreciate it! Bring on the video!!!! That was so much fun to watch. Congratulations!!! Erin Clarke, Next Food Network star! The video really brought the food to life, and now I’m starving and NEED one of these amazing sandwiches. All the flavors look incredible. Love the new blog intro video, Erin! Well done! And these sandwiches? Can’t get enough of the maple-bourbon action going on here. YUM! Love the videos, Erin! You came across as such a pro! The sandwich obviously won me over too, because, well, bbq and bourbon are just the best. do not like dark meat………could breast meat be used? is the greek yogurt dominate in the slaw? I need to be able to hide it….. thanks! Hi Sue! Although you can certainly use chicken breast, I find that it dries out really easily in the slow cooker. I would definitely keep an eye on it, check it early, and if possible use bone in chicken breast, as they are less prone to drying out. I actually am not a big fan of dark meat either, but in this recipe it doesn’t bother me at all. For the slaw, the Greek yogurt taste is nicely tempered by the other flavors. If you want to be safe, you could you use half Greek yogurt and half light mayo. I hope that helps and that you enjoy it! Will definitely be making the original recipe soon! Greg, this BBQ chicken would be amazing on pizza! Thanks so much for sharing this fun twist. You are making me hungry! I stumbled across your blog while trying to find slow cooker recipes my finicky boyfriend would eat. I read through a few and he insisted we try this one. The slaw is too much of a crunchy vegetable stretch for him right now but I really wanted know how the apple flavor would play with the chicken so I found an apple bourbon. I’ll let you know how it turns out. Thanks for the great recipes, keep them coming! Sarah, apple bourbon sounds DELICIOUS. I hope you both love the recipe! I made this tonight – delicious! Really so great. I used jack Daniels and cut it to 1/4 cup but that’s the only change I made. I added hot sauce to my sandwich to spice it up. Followed the slaw to a T but I used 2% greek yogurt. It was a very thick dressing but neither of us like mayo so we both really enjoyed this. We will absolutely be making this again. Thanks for a great recipe! Caitlin, I am so excited to hear this! Thank YOU for leaving this lovely review. That sounds like a great way to use up the leftover sauce, Melissa! I’m glad you enjoyed the recipe . . . thanks for leaving such a wonderful review! Holy YUM!! Hubby and I made this for dinner tonight. We followed the recipe (mostly) as is.. the few substitutions we made was we used bone in, skin on chicken breasts and also added about half a jar of pickled jalapeños because we like some heat. The slaw was the perfect accompaniment! Can’t wait for leftovers all week! Served them with some baked sweet potato fries and we were both very happy campers. YAY Kristen! I’m happy to hear the recipe was a hit. Thanks so much for giving it a try and taking the time to leave this wonderful review! One of the best recipes I’ve tried. A winner every time! Christine, I am so thrilled to hear this! Thank you for taking time to leave this stellar review too. It means a lot! Great! I made this for the 4th of July, and it is wonderful! I would love to amplify the maple flavor a bit, but really, it’s perfect as-is. I liked the slaw on the sandwich, not as much on it’s own. I am taking this chicken to our next potluck. Thanks, Erin! Eileen, I am so pleased to hear how much you enjoyed the recipe, thank you! !